Colorado Springs is 755 feet higher above sea level than the city of Denver, and yet the city is sort of a little sister to the bigger state capital of Denver. 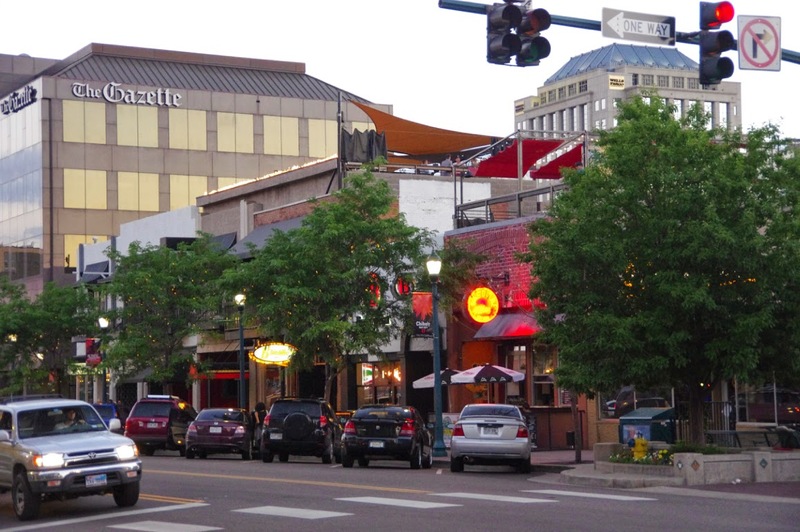 Colorado Springs is the place your plane might be rerouted to during high winds at Denver International Airport, it might be the city you drive through on your way from Texas, New Mexico, or Arizona on your way to our big ski resorts. 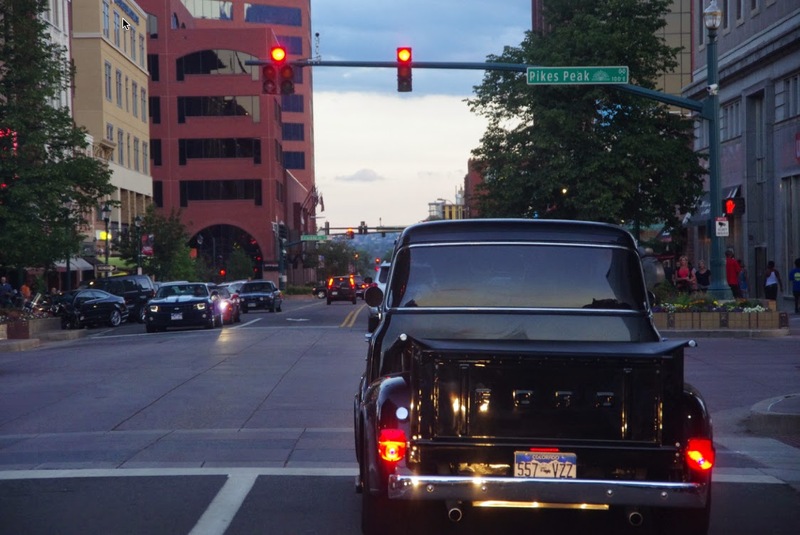 But the second most populous city in the state of Colorado has it's own unique feel. 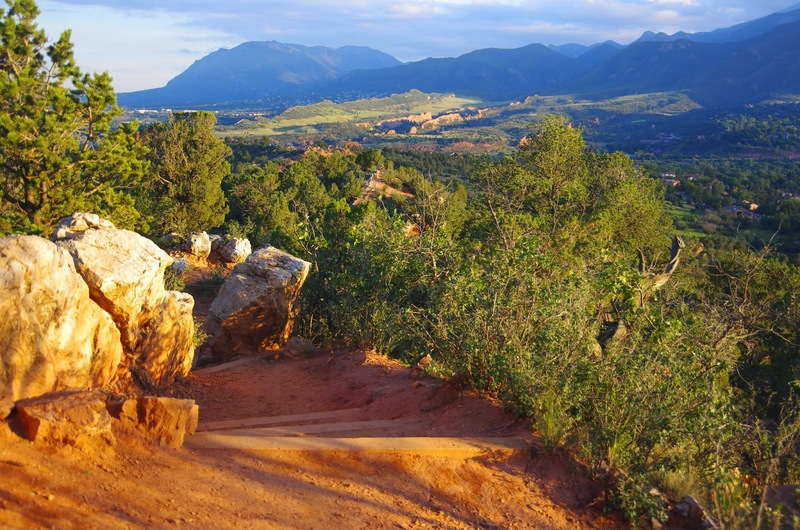 Colorado Springs sits in the setting sun shadow of Pikes Peak and is home to the United States Air Force Academy as well as the North American Aerospace Defense Command (NORAD) at Cheyenne Mountain, plus the impressive United States Olympic Training Center. 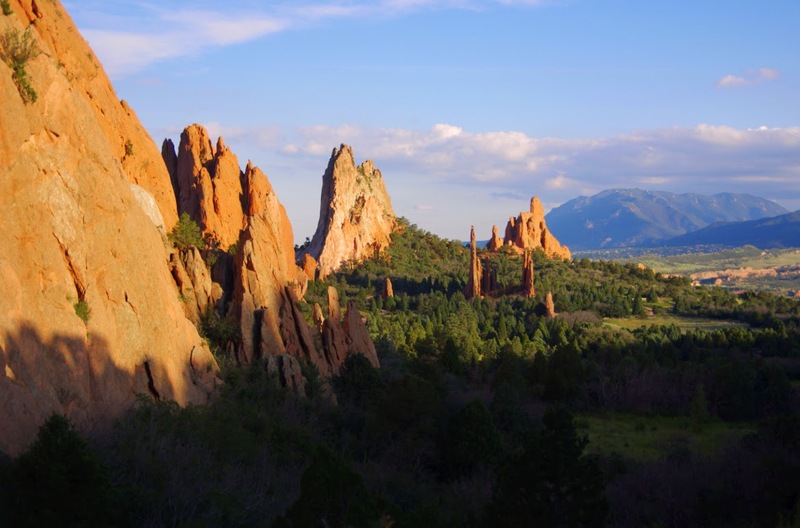 Known for it's religious ways, Colorado Springs is called "The Christian Mecca," (with its 81 different religious organizations), but mostly it is simply called "The Springs". 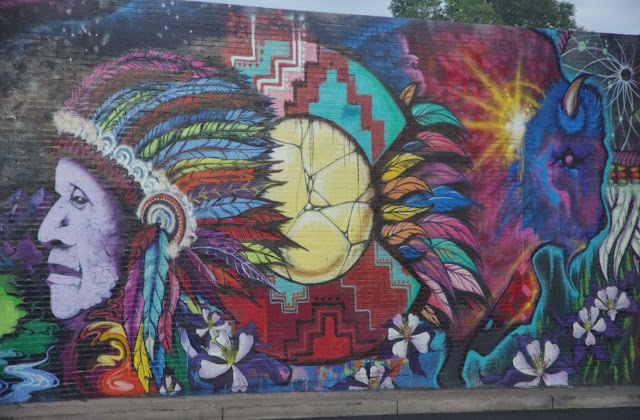 I happily visited Colorado Springs two weekends ago. 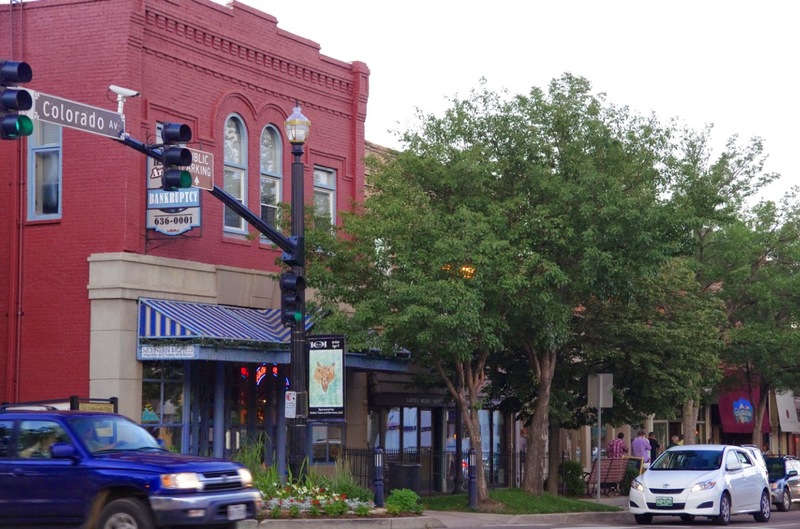 Within a very small space this city will offer varying experiences to visitors and locals attending Stage 4 of the USA Pro Challenge on August 21, 2014. I honestly would be happy watching the race in any of the four major recommended race day viewing locations mentioned below in this post. 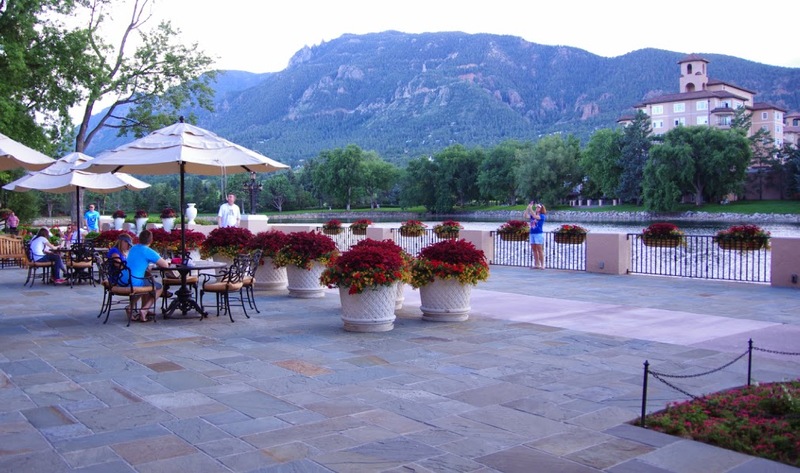 Colorado Springs is a very well organized host city; ready to welcome fans with it's spectacular natural beauty. Colorado Springs circuit race. 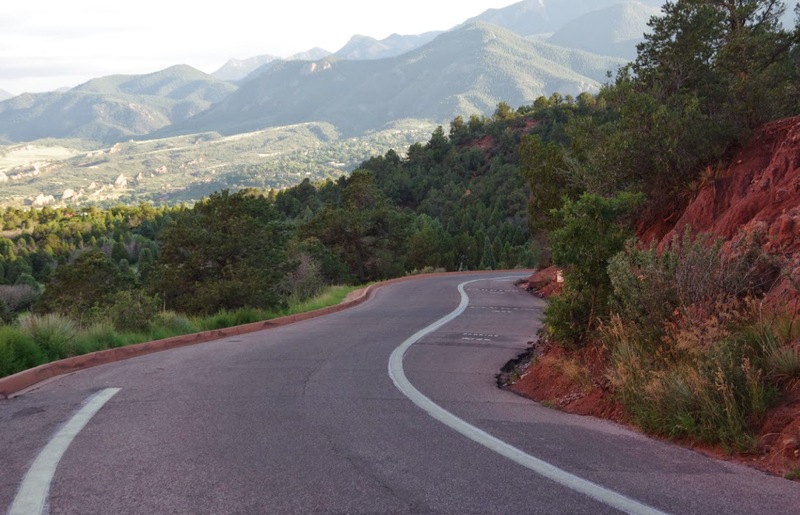 Two initial laps near Broadmoor Hotel, then 4 laps of a 16-mile circuit with climbs through Garden of the Gods to downtown Colorado Springs. This is not a climbing stage, this is a pure circuit road race. It requires all around climbing, descending, cornering skills, bursts of effort and a fearless sprint. Stage 4 will make the race very interesting mid-week and we will see fresh faces on the stage win podium. 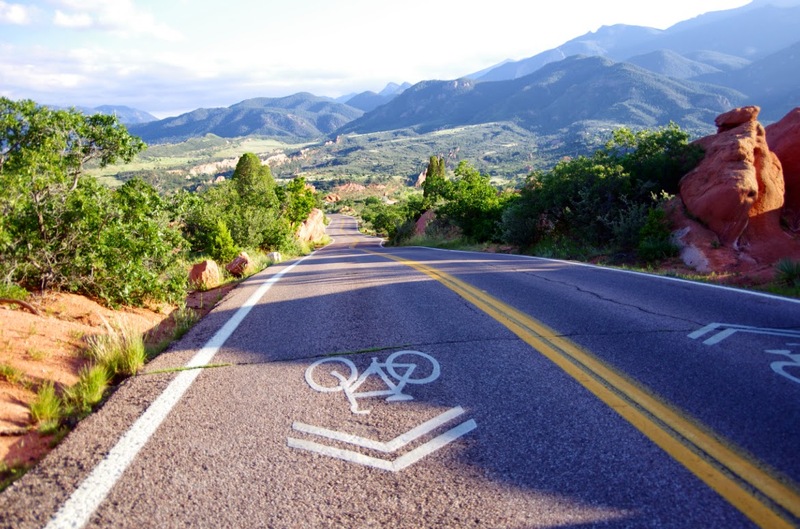 Colorado Springs Facebook Page and the official USA Pro Challenge race website. A very excellent website has been created by ColoradoSpringsSports.org (COSStage4.org) for spectators. 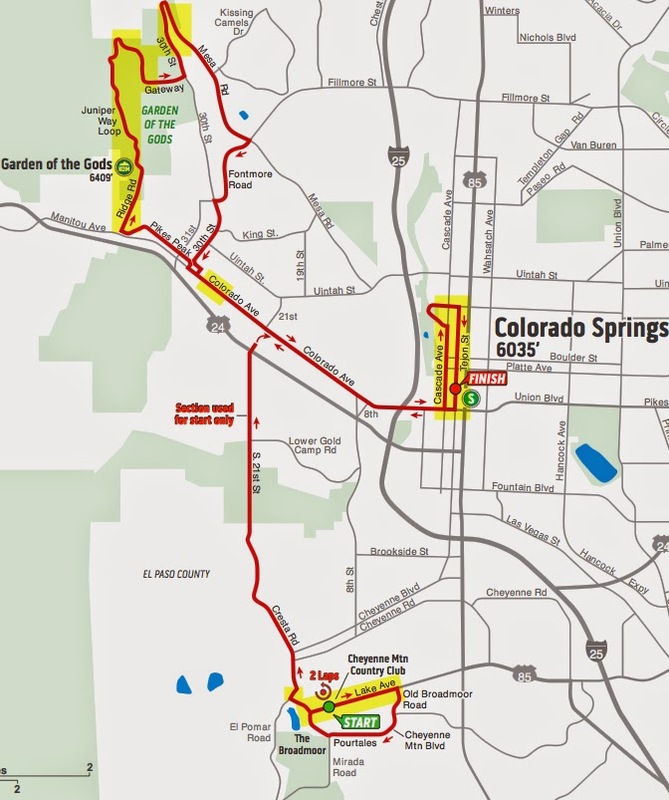 With extensive information Colorado Springs USA Pro Stage 4 Information Page - offering exact route maps, parking, street closures and highway impacts and where you will be able to cross the route at crossing points. They have created a Google Route Map and road closures per street list. Definitely visit their website or the links below. Also visit the CDOT website for the USA Pro Challenge for road closures of State highways (select the Stage 4 tab). 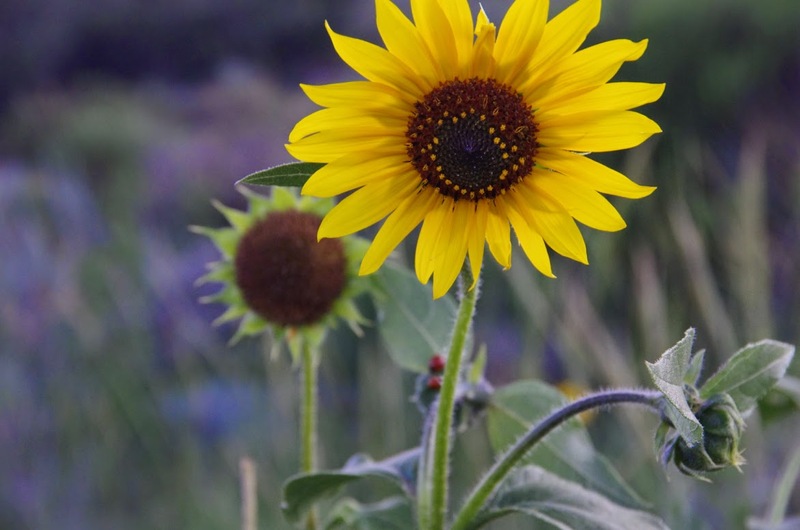 Much more tips, news and information about the 2014 USA PRO CHALLENGE by Pedal Dancer®. This will be the views fans will have looking down the sharp rise up Ridge Rd -Stage 4. Just imagine this view filled with professional cycling teams heading straight toward you. 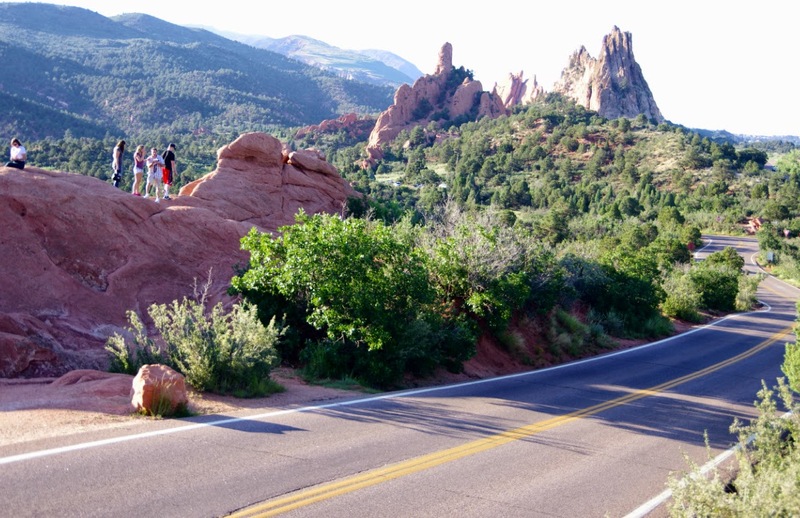 Fans will enjoy good views on Ridge Rd in Garden of the Gods, (just near this point there are porta potties and a (closed at 6a.m.) parking lot). The location of the finish line of Stage 4 will replace this old Ford pickup truck. 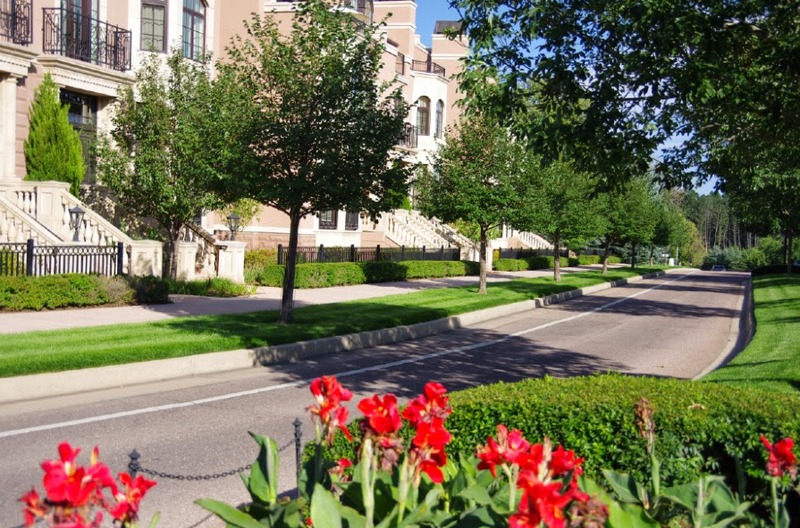 The start is located on Lake Ave, a couple blocks east and in front of the Broadmoor Hotel. 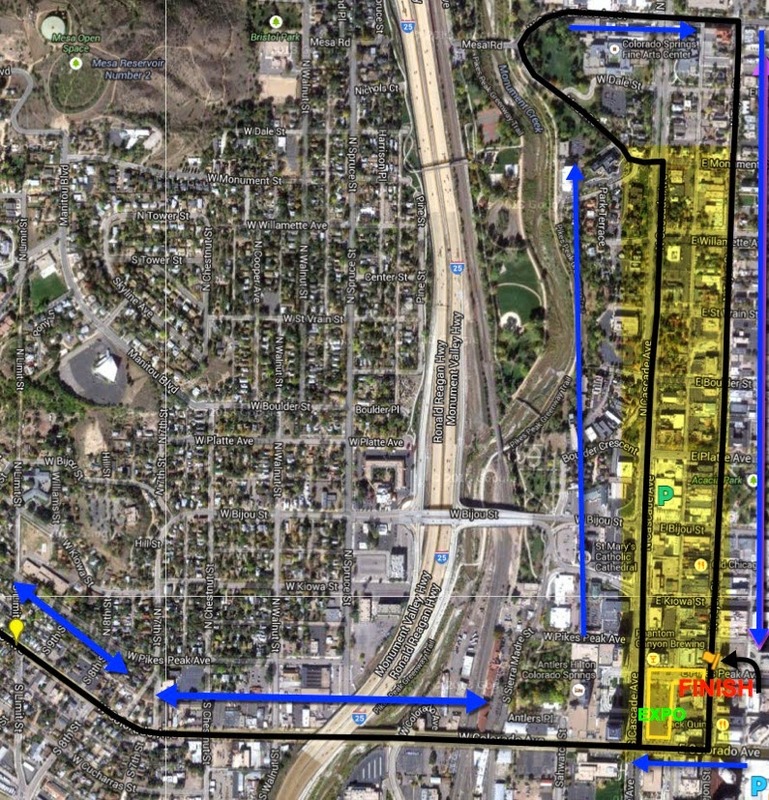 The peloton will complete 1.9 loops peeling off onto Lake Circle / Cresta Rd / 21st St to meet W. Colorado Ave and race east into downtown Colorado Springs. 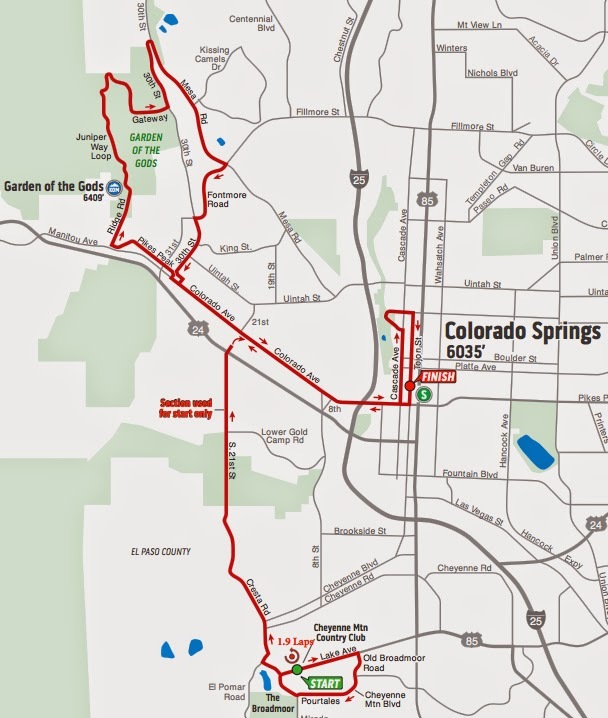 After looping up N. Cascade Ave and down Tejon, the riders will begin four complete loops out to Garden of the Gods and back to downtown. If you have a bike you might be able to wisely skirt around the back streets between the start and finish or from the start to Colorado Ave. If you drive or bring family, you might prefer to pick one of these main locations for viewing on race day. 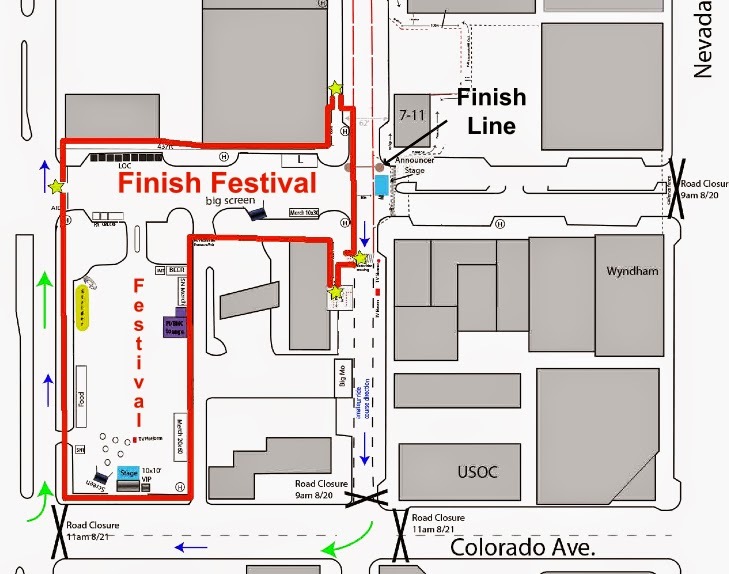 Although you will be able to see both the the start and finish of the final circuit laps in downtown, be prepared to walk from distances as roads and parking will be congested in both locations (study road closures and maps). 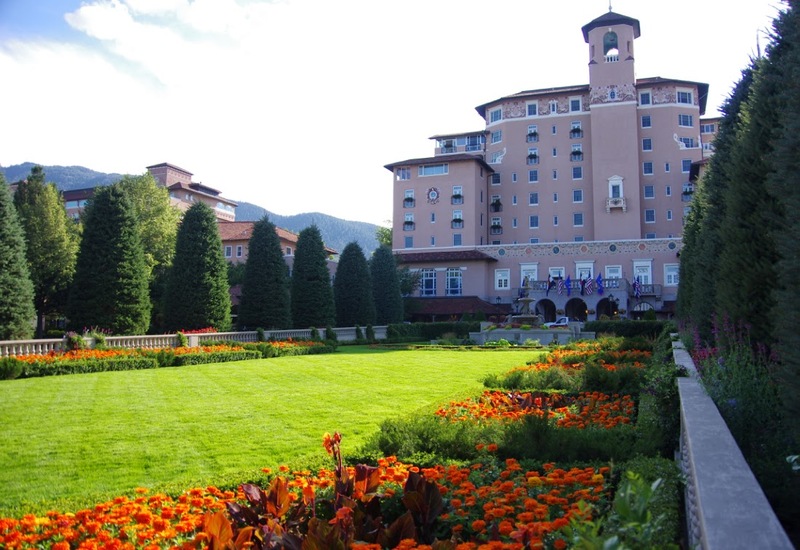 The Broadmoor Hotel is a unique award winning hotel. 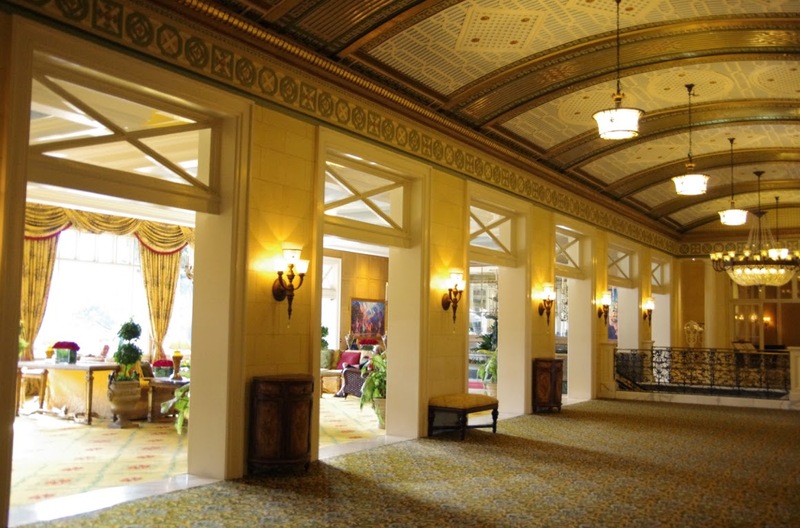 A National Historic Preservation Site, the magnificent architecture will have you craning your neck to take in the early 20th century detailing. 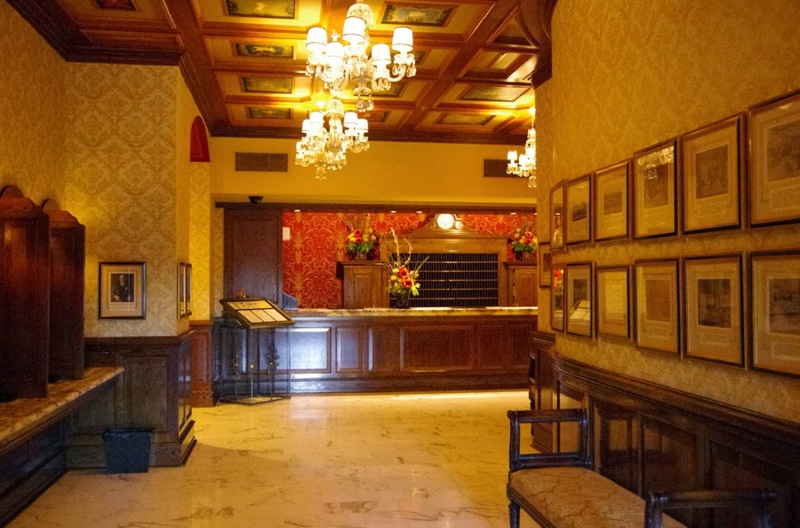 This hotel is quite an operation with the large Cheyenne lake, full spa, golf course, tennis club, meeting and conference rooms, 18 restaurants and 700 rooms for accommodation. On race day team cars will be parked nearby and racers will be presented upon sign-in at the sign in stage near the start line. Teams will arrive around 11:45am for sign-in at the Start. This is your chance to get autographs and good photographs of the riders. Once the call-ups of the current jersey wearers and the singing of the national anthem are complete, you will see the riders pass by twice! 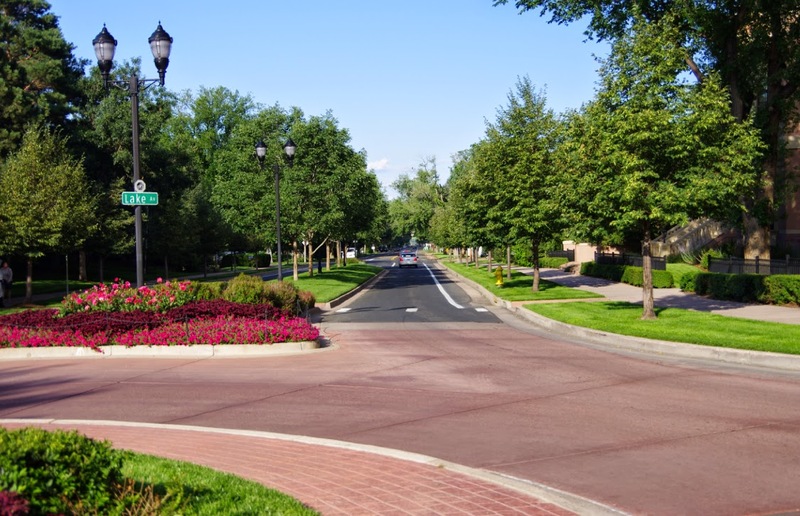 With plentiful parking, special events, the race Expo and festival area, public parks, many restaurants, the location of the final sprint finish and the podium presentation - downtown Colorado Springs will be a very active entertaining place to be on race day. Read more about race day activities on the ColoradoSpringsSports.org website. If you are downtown - you will see the racers 5 times! 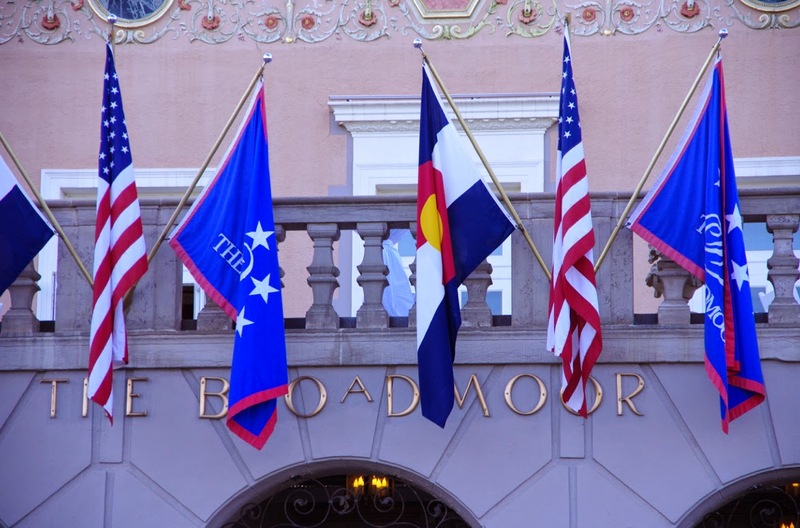 Race start time is 12:50am near the Broadmoor Hotel. I would recommend being in the downtown area for parking, exploring the expo, and determining where you want to watch the race by 11:00-11:30am, earlier if you intend to eat or attend the events (below). 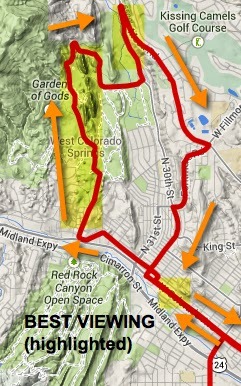 The peloton will race through downtown before heading to Garden of the Gods. Ride your bicycle to the Festival: Bicycle Colorado is hosting bike valet locations at each stage finish expo area. They will hold your bike safely for free (if you wish you may purchase an annual membership to Bicycle Colorado as a thank you). The Bike Valet Lots are being fully sponsored by Lexus a new race sponsor for 2014. Thank Lexus. 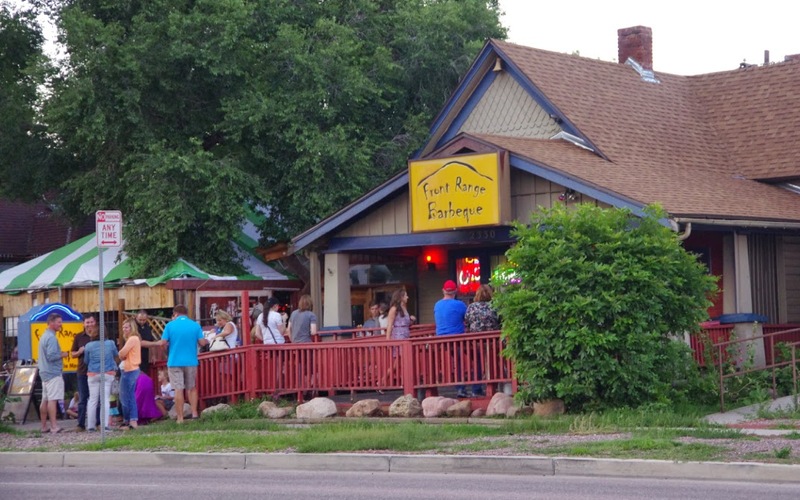 The north end historic district between 23-27th on Colorado Ave, has a cluster of restaurants and shops that should be a nice place to gather to see the race. If you locate yourself along the east end of Colorado Ave, you will see the peloton pass by nine times, if you are located west of 21st, the peloton will pass by eight times! 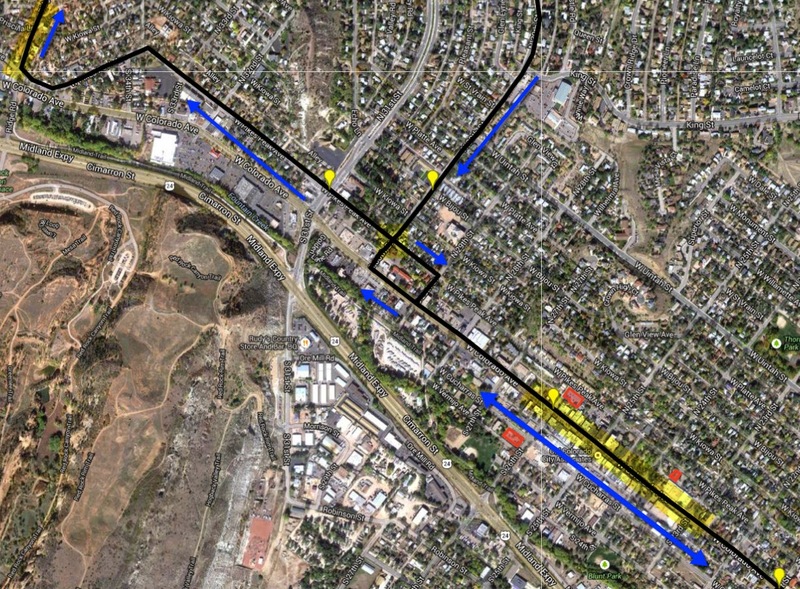 Race start time is 12:50am, road congestion will build and Colorado Ave will be fully closed at 12:40am. I would recommend being in the area for parking and viewing by 11:30am, earlier if you intend to dine before the race. 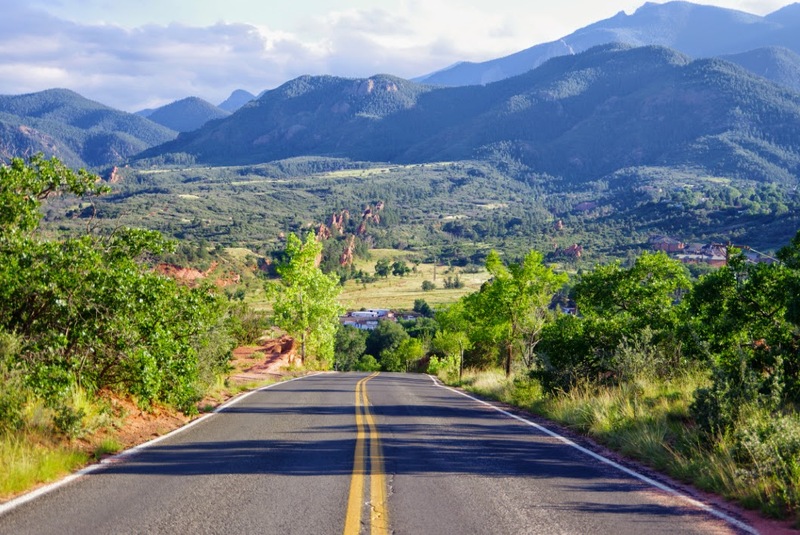 The views, atmosphere and opportunity for photo opportunities should be excellent on Ridge Rd and Juniper Way Loop through Garden of the Gods. The road is quite narrow, so expect big crowds (even on a weekday/work day). You will see the riders race by 4 times! 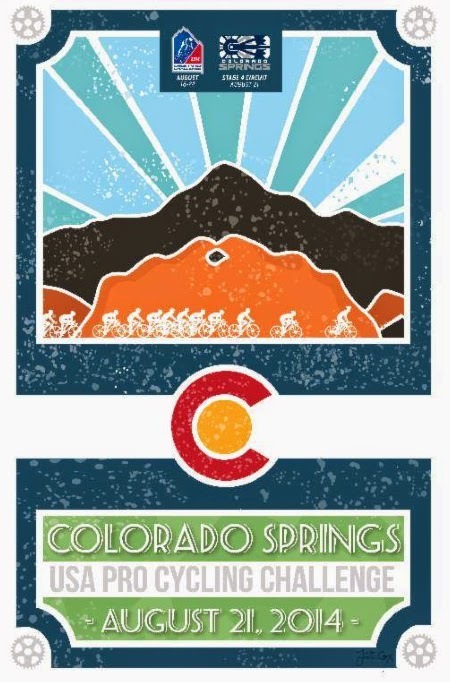 Parking advice for spectators wanting to see the USA Pro Challenge in Garden of the Gods, is offered by Doug Martin of Colorado Springs Sports Corp., he states there will be "No shuttle buses, best option will be for fans to enter the Park via Garden Drive and park near the Garden of the Gods Trading Posts. All other entrances will be closed to prevent vehicles and vehicle traffic from being in the park during the race." If you enter the park early you may walk or ride your bike up Ridge Rd (closes at 6:00am to cars) from below (W Colorado Ave). You may also enter from N 30th St (closes at 1:00pm) to walk across Gateway Rd to Juniper Way Loop (you will not be able to exit until the road reopens after the race at Fontmore Rd/31st or Mesa at 4:15pm). To watch the race on Mesa Rd, you may approach from the northeast via Centennial Blvd or Garden of the Gods Rd (these entrance points close at 1:00pm). Race start time is 12:50am, access roads near the park close at 1:00pm, roads inside the park close at 6:00am! For those wanting to be on Ridge Rd or Juniper Way Loop, I would recommend beginning your journey into the park by 10:00-11:00am depending on how far up the road you intend to climb and how fast you walk or ride (earlier if you want a prime viewing spot). 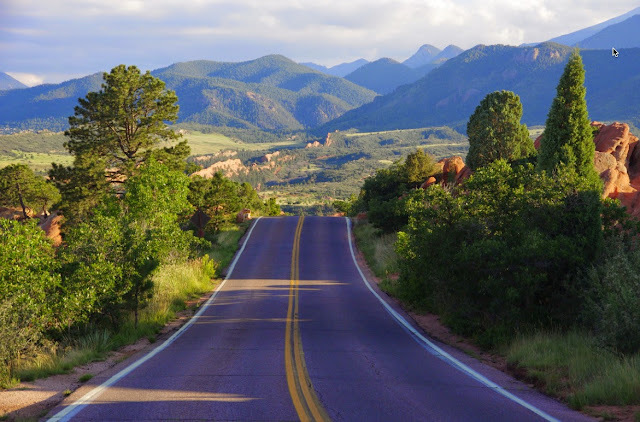 Route of Stage 4 through Garden of the Gods - best viewing! 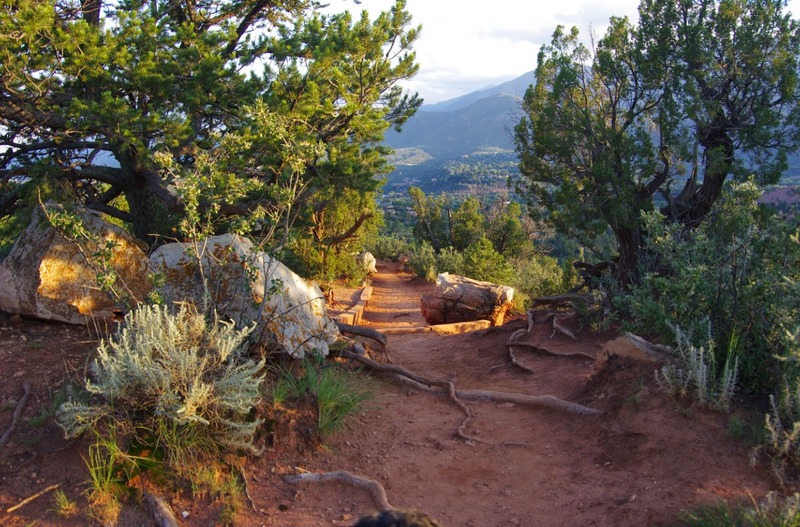 Be a tourist and visit the summit at 14,115 ft. Ride the Pikes Peak Cog Railway, the highest cog railway in the world, hike the 13 mile Barr Trail or cycle up the highway to the summit. 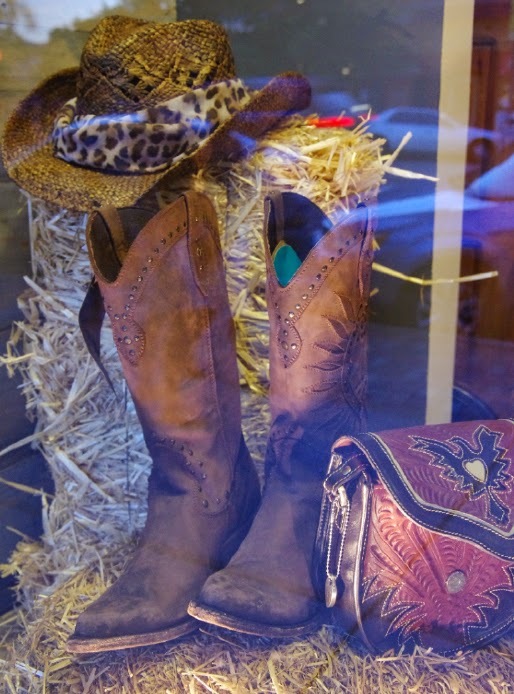 More information about Pikes Peak.